“Don’t cry because it’s over. Smile because it happened.” This time of year, this anonymous proverb seems to go viral. New Year’s Eve muddles me up. Sure I have regrets, but I’m excited about what’s to come, and I want to talk with friends about both. Turns out I’m not alone. Three mix masters of New Mexico, from north to south, promise to soothe our spirits with cocktails and mocktails made with local ingredients. If you’re in the mood for special spirits, the place to go in Santa Fe is the recently refurbished Secreto Bar & Loggia, in the Hotel St. Francis, an easy-upscale venue where you can unwind from holiday hustle. Here, mixologist Chris Milligan is at your service. Garnishing Milligan’s bar are fresh green herbs and vibrant limes and oranges, all waiting to be elixirfied. Secreto’s menu offers an array of seasonal cocktails. The drinks are made with the season’s best-tasting ingredients, many sourced from the Santa Fe Farmers’ Market—one of the best in the country, according to the Daily Green (www.thedailygreen.com), a popular how-to website for going green. Likewise, Milligan’s palette of cordials, syrups, tinctures, and some bitters are made in-house. With his nearly 20 years behind the bar and a keen interest in the history of libations, this dean of drink entertains patrons with his intriguing cocktail lore and thirst-quenching stories. Milligan also keeps folks informed and entertained with his blogs, “The Santa Fe Barman” (http://santafebarman.wordpress.com) and “The Booze Blog: Drinks Without the Hangover” (http://blogs.forbes.com/booze). In Albuquerque, at the swank Q-Bar Ultra Lounge in the Hotel Albuquerque in Old Town, mixologist Dan Pinzon stirs primo cocktails. This New Mexico State University alumnus has eight years of experience. 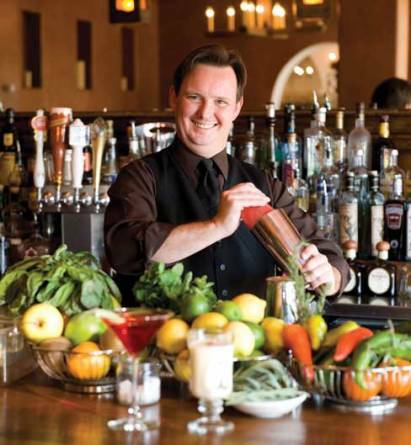 His mentor was certified mixologist Michael Trujillo, of the Albuquerque-based beverage distributor Southern Wine and Spirits of New Mexico, who taught Pinzon the art of crafting cocktails, from proper balance and taste to perfect presentation. Pinzon’s unique flair for integrating into his creations the region’s fruits and vegetables impresses the clientele of this posh nightspot. And there’s more to celebrate: Pinzon was recently nominated to represent New Mexico at Shake It Up, a prestigious mixology competition held annually by Southern Wine and Spirits of Las Vegas, Nevada. The harmonizing flavors in Pinzon’s Old Town Martini, a cool cocktail muddled with fresh basil and New Mexican plum, will wet your whistle this New Year’s Eve. In fact, the origin of the name Albuquerque is the Arabic al-barquq, meaning apricot or plum. Splashes of fresh-squeezed orange and grapefruit juices are mixed into this tasty treat, which is served topped with a second leaf of fresh basil. Pinzon’s tongue-tingling Albuquerque Quencher, free of booze, incorporates such locally grown finds as the lemon cucumber (in season), a sweeter, yellow cucumber grown in New Mexico gardens and found at our farmers’ markets. These cukes have a nostalgic meaning for this local boy: “Lemon cucumbers were introduced to me by a New Mexico State University agriculturalist while I was in college.” A fine strainer, Pinzon notes, helps keep pulp out of the glass and the cocktail clean; he suggests also investing in a good bar spoon, a lime press, and a muddler. Down south, next to Las Cruces in Old Mesilla, the Double Eagle Restaurant’s elegant Imperial Bar is known for its margaritas and being the winner of the 2002 Margarita Shake Up. A sixth-generation New Mexican, Charles Winfield “Win” Ritter II always has a tasty concoction. Ritter grew up in the state’s hospitality industry—his father owned two New Mexico hotels, The Lodge at Cloudcroft and the Holiday Inn in Las Cruces, both home to famous saloons and cantinas: Rebecca’s and the Red Dog Saloon in the former, and the Billy the Kid Saloon and Pancho Villa’s Cantina in the latter. Celebrities from Dolly Parton to U2 patronized these hotspots. Ritter’s father later opened an Irish tavern, O’Ryan’s Brewery, in Mesilla Valley Mall, where Win worked, and the beers served there earned a following. “We were known as the Beer Gods,” he reflects. In 2001, Ritter left brewing and moved to Old Mesilla. These days, at the Imperial Bar, this beverage guru gets in the mood to make Bloody Marys and (what else?) margaritas. Ritter’s trademark style is infusion: “I take a classic cocktail and jazz it up with a local flavor that people love.” For example, he fire-roasts farm-fresh Big Jim green chiles from nearby Hatch to create an infused vodka that gives his much-praised Old Mesilla Mary a spicy Southwestern taste, complete with a salted glass rim and a wedge of lime. Now, as fireworks herald 2011, a toast to a flavorful New Year! Wendy Sue Gist is now in the spirit to toast new beginnings, sipping, singing, and dancing the night away. Cocktail and mocktail by Win Ritter II, food and beverage director, Imperial Bar, Double Eagle Restaurant, in Old Mesilla. All recipes printed with permission. Chris Milligan’s must-try cocktail combines well with classic New Mexican food and can be found on the winter bar menu of Santa Fe’s Secreto Bar & Loggia, in the Hotel St. Francis. Bitter End Mexican Mole Bitters are available at Susan’s Fine Wines and Spirits in Santa Fe, or online at www.bitterendbitters.com. Muddle one sage sprig with chokecherry syrup and lime juice. Add tequila, bitters, and vermouth. Shake with ice in cocktail shaker, then strain into chilled cocktail glass. Garnish with second sage sprig, lightly spanked, inserted in glass. Chokecherry syrup: Stir together in saucepan 4 ounces (by weight) chokecherry jam and 4 fluid ounces water. Simmer over medium-low heat 2 minutes, then let cool to room temperature. Transfer to sealable container and refrigerate. Chris Milligan’s version of Rompope, a.k.a. 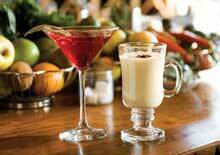 Mexican Eggnog, reflects the flavors used in New Mexican holiday baking. Process almonds in food processor until they form a coarse meal. Add 2 ounces milk to form paste. Beat egg yolks until a bright, lemony color. Meanwhile, add to almond paste remaining milk, sugar, vanilla, canela, red chile, and anise, and heat over medium heat until sugar is dissolved. Remove from heat and let cool. Temper milk mixture into beaten egg yolks. Return to medium-low heat and stir frequently until mixture reaches 160 degrees, then remove from heat. Serve warm or cold. Best served in old-style punch glass or Irish coffee mug, but a small wine goblet will do. Garnish with stick of canela. Refrigerate remainder. Cocktail and mocktail by head bartender and mixologist Chris Milligan, Secreto Bar & Loggia, at the Hotel St. Francis, Santa Fe. Dan Pinzon’s fruity martini is a local favorite on the menu of the Q-Bar Ultra Lounge, in the Hotel Albuquerque, where it’s known simply as the Plum Martini. Muddle 1 basil leaf gently with simple syrup. Add ½ plum and muddle. Add vodka and Chambord. Next, add orange and grapefruit juices. Add ice and shake vigorously, then fine-strain into martini glass. Garnish with basil leaf. A regional twang gives you a buzz without booze any time of year. 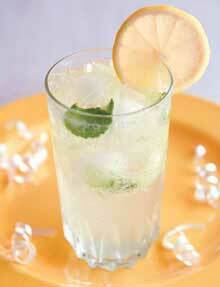 In Tom Collins glass, muddle cucumber slices with simple syrup and lemon juice. Add mint leaves and muddle very gently, being careful not to crush mint. Add enough ice to fill glass. Add equal amounts club soda and Sprite to fill glass. Stir with bar spoon, mixing so drink is balanced. Garnish with lemon wheel. Cocktail and mocktail by mixologist Dan Pinzon, Q-Bar Ultra Lounge, in the Hotel Albuquerque, Old Town, Albuquerque. 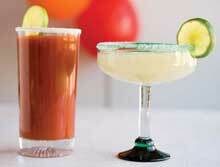 Win Ritter’s sultry Bloody Mary has a fiery flavor, thanks to vodka infused with green chile. Combine all ingredients in cocktail shaker. Shake, then pour into highball or pint glass with rim encrusted with Kosher salt. Garnish with wedge of lime. Green-Chile–Infused Vodka: Roast and peel (but don’t rinse) six to eight large Big Jim green chiles. Leave seeds in for extra heat. Add chiles to liter of moderately priced vodka. Cover tightly, and store two weeks in a low-light, even-temperature place. After two weeks, taste. If not hot enough, roast and peel 1 jalapeño pepper and add to vodka. After three days, taste again, then every two days thereafter, until heat level is right for you. Strain and discard peppers. For clearer results, strain through paper coffee filter. The exotic flavor of the nectar of the agave cactus, which flourishes in southern New Mexico, takes the place of tequila (which is also made of agave) in Win Ritter’s extra-delicious mocktail. 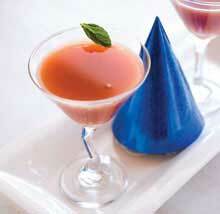 Combine all ingredients, stir, then pour over ice in footed margarita glass, its rim coated with Kosher salt. Garnish with lime wedge.